Manufacturers of everything from transformers to generators, wind turbine systems to hybrid and electrical have been able to improve the integrity and performance of their own products through the use of Nomex® papers. With excellent thermal, chemical, and radiation resistance, Nomex® is so flame and heat resistant that it is used in firefighting equipment. 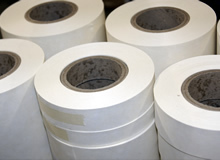 As the original form of Nomex® paper, type 410 is widely used in electrical equipment applications, offering high inherent dielectric strength, mechanical toughness, flexibility and resilience. Available in 11 thicknesses (0.05 to 0.76 mm) (2 to 30 mil), Nomex® paper type 410 is used in almost every known high temperature electrical sheet insulation application. Nomex® Type 411 is the uncalendered precursor of Nomex® type 410. Available in five thicknesses (0.13 to 0.58 mm) (5 to 23 mil), it has a density of 0.3 and correspondingly lower electrical and mechanical properties. It is used in applications such as motor phase insulation and transformer coil end filler, where high bulk and conformability are of prime importance. Nomex® type 411 offers increased impregnability and saturability when compared to Nomex® type 410, making it suitable for use in cast resin applications as turn and layer insulation. Designed for high-voltage applications, Nomex® type 418 is perfect for motor conductor and coil wrap, transformer ground and layer insulation. This calendered product has high inherent dielectric strength (30 to 40 kv/mm), which can be readily impregnated with varnishes where this is desirable. Nomex® Type 418 is available in 5 thicknesses, from 0.08 to 0.36 mm (3 to 14 mil). It is a calendered blend of aramid and mica, offering increased voltage endurance over Nomex® type 410 when subjected to corona attack. Type 992 is a low-density pressboard produced in two thicknesses 1.6 and 3.2 mm (63 and 125 mil), with a specific gravity of 0.5. This material's low density allows easy formation of complex shapes, and provides the highest saturability of Nomex® pressboard products. Type 993 is a medium-density pressboard produced in thicknesses from 1.0 to 4.0 mm (40 to 160 mil), with specific gravities of 0.7 to 0.9. This material provides a balance of rigidity and conformability, along without standing saturability and excellent properties in oil. Type 994, a high-density pressboard, is available in thicknesses from 1.0 to 9.6 mm (40 to 380 mil) with specific gravities from 1.1 to 1.2. It provides superior stability under compressive loads. This material will also absorb oils and other fluids, though not as readily as Nomex ® types 992 and 993.